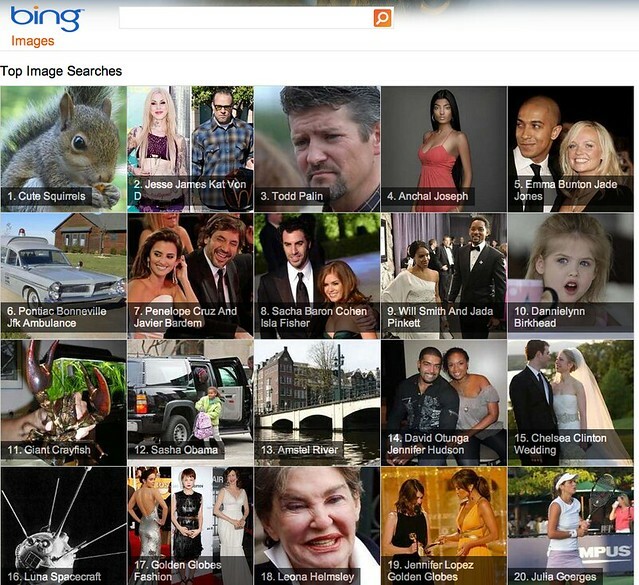 Bing revamped their image search landing page to include the top searches for the day, grouped by pictures. It can be useful to see what the daily top image searches are on Bing and the way Bing laid it out makes it fun to look at. What is interesting is that "Cute Squirrels" is a top search query today. I mean, if it was a hot query shouldn't it also show up on Google Trends? Update: As Simon pointed out in the comments it was squirrel appreciation day. Would not have known that without Bing! How do you like the new landing page? Obviously it will help Bing increase their search query volume but it is also useful and pretty.